I just love shopping for beauty products. Whenever I'm at the department store, I'd spend an hour or more just going around the beauty section and check the shelves. My basket would be full of hair products, cosmetics, skin food, and those cute tools and accessories that I just can't resist. It just makes me so happy! I think this is my addiction, well, next to footwear, haha! I needed a few items but it was raining last week and during the weekend. Now, this rainy season is not an excuse anymore for me not to get my kikay stash because there's BeautyMNL! 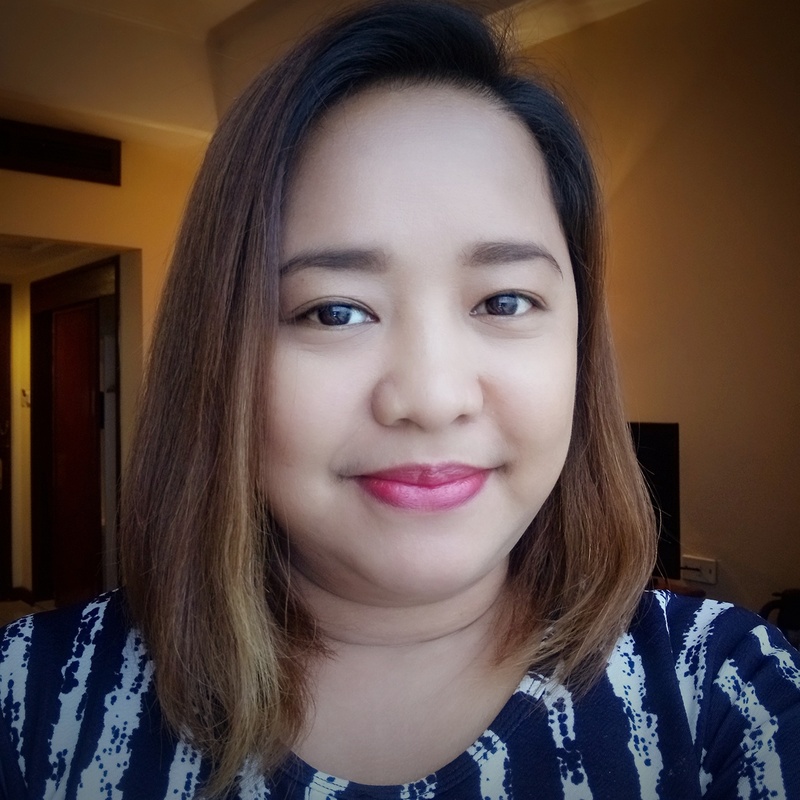 As the rains poured last Friday afternoon, I was comfortably sitting on our living room couch with my laptop and browsing www.BeautyMNL.com. Oh boy, how happy I was! Just imagine 300+ beauty product brands all in one site! 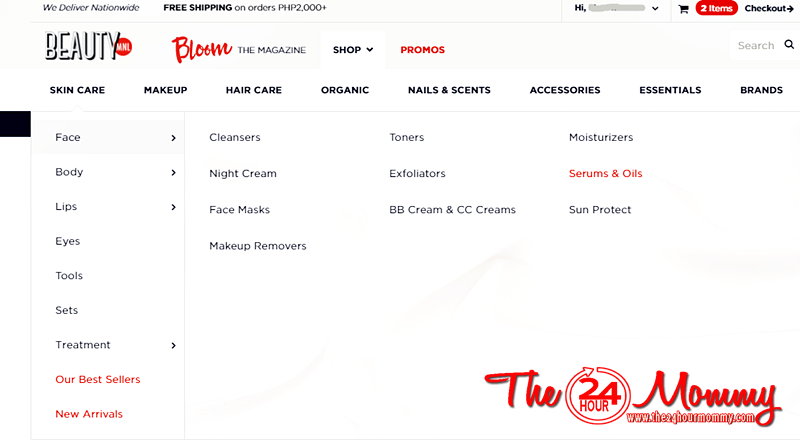 Even with all these humongous choices, browsing through the BeautyMNL site was a breeze because each product is grouped in categories. The gallery can also be sorted according to arrival, rating, and price. Since I'm currently bothered with how dry my hair has become lately, I immediately looked for a hair treatment product that will hopefully revive my tresses. 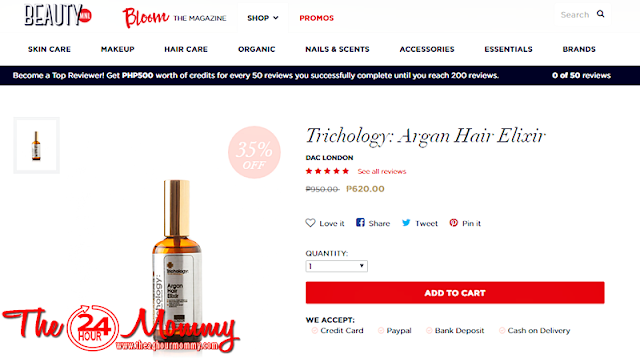 Trichology: Argan Hair Elixir caught my eye not only because it's on sale but also because it had a 5-star review. I'll also post my review of Trichology in a few days. I'm gunning to complete 35 reviews of the products I bought and will buy in the future from the BeautyMNL site to enjoy the Php 500 rewards credit. Pretty cool, right? I'm not familiar with Trichology though I know that Argan Oil is really good for the har. 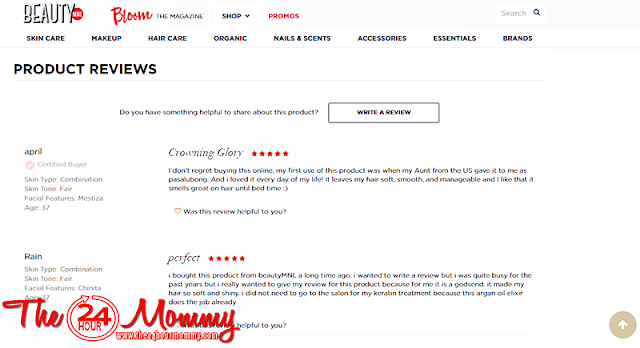 So I checked the reviews posted by other BeautyMNL shoppers and the good feedbacks convinced me to give it a try and add it to my Shopping Cart. After that first item, I searched and clicked away. My cart was filled in no time. Nakakalibang! The items I bought were exactly worth Php 2,000 so the delivery fee got scratched off my invoice. Also, I was elated to see that Dove Whitening Deo sample that BeautyMNL added for free. Who doesn't one freebies? And that was it! I was done paying and checking out my items in no time. I think, like most girls, I took more time looking around and thinking about buying this and that. I admit, I had to remind myself that I only had a budget for this BeautyMNL "shopping trip," haha! Talk about self-restraint! So anyway, remember I placed my order on a Friday at 4:25 p.m., right? I was expecting to receive the items today, Wednesday, which is 3 working days after because the BeautyMNL site mentioned that it does not deliver on weekends. Plus, I have a provincial address. Well, guess what? I got my items last Monday morning! I was really happy to receive all my items early because we were scheduled to watch Bro. Bo Sanchez's birthday concert at the Smart Araneta that night. I badly needed the Tony Moly BB Cream and it arrived right on time! I am strongly recommending shopping at BeautyMNL especially for fellow busy mommies. And if you shop before July 20, you will get to enjoy Php 300 off on orders 2 thousand bucks and up by using the ILOVEBMNL promo code upon checkout. 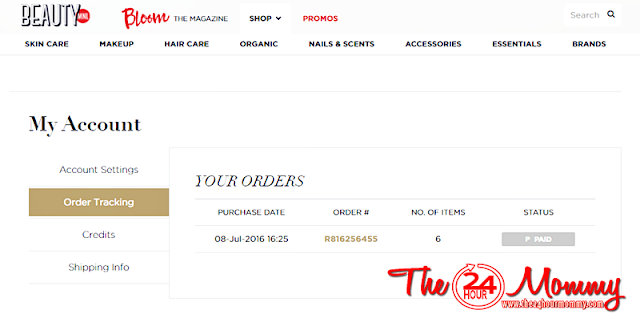 I'm sure that this BeautyMNL shopping spree will not be the last for me. I'll be getting some more items soon because I'm really satisfied at how fast and breezy this transaction was. I hope you get to try it, too! Looks like you bought a lot of great products. I'm obsessed with Tony Moly products, especially the sheet masks. I didn't know they made a BB cream, will have to check it out. 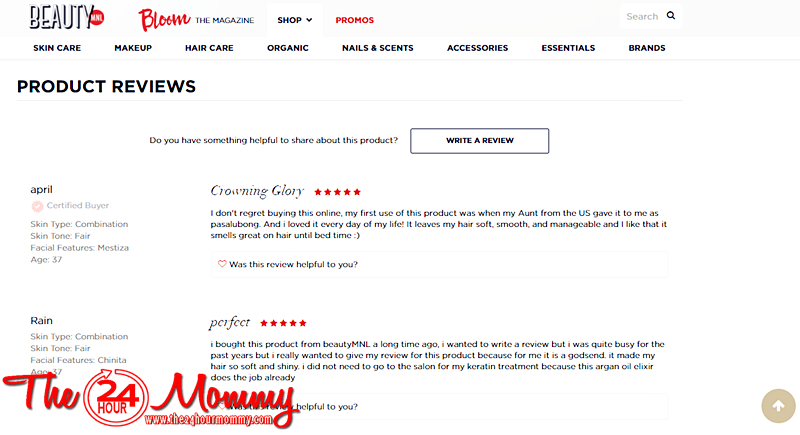 I love shopping for beauty products, but have never tried it online. I have to check this out! Online shopping will always be awesome, especially since it's convenient and you don't have to go to the mall to get new items! I'm glad you're happy with your shopping experience! 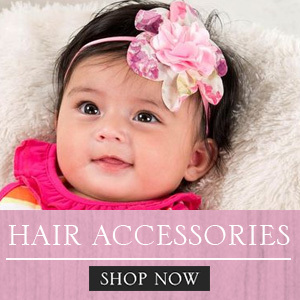 What an awesome way to shop for all of your beauty needs. You had a great haul! Looks like you got a good stash there. I would love to try the hair treatment too. There are certain times in the year that my hair gets dry and dull. Maybe it would be just the right product I am looking for. Wow, nice experienced! I will go shop at this site too! I always like it when beauty products I order arrive fast. I don't like the idea of them waiting in the sun. 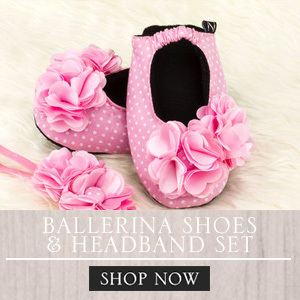 I love shopping online. I find so many bargains, deals and freebies! I love free beauty samples. Ooooo lots of great products there!!! I just tried that elf primer my sled the other day! What an awesome deal, and I cant believe how quickly it arrived. You have a lot of nice makeup products in your stash! I love shopping for makeup. Sounds like a great store to check out! Great Piece of knowledge Mauie.